My name is Horace Axtell, and I am 4/4 Nez Perce. I chose to become a traditional dancer because I strongly believe in our Indian way of life in every way. Dancing and dressing in our finest regalia is one part of our way of life that includes participation by all ages—no one feels old when we dance. We have fun, and we also show respect to all the animals, birds, and earth materials we use to make our regalia and drums. The power of the spirits makes our songs; the spirits empower our singer-drummers to make our music. We gather many places all year to see old friends and make new friends. Being a veteran of World War II, I like to feel the strength of all warriors from the past and hear and dance to the old songs. We try to follow the footsteps of our elders, who cleared the way for us with their clean minds, hearts, and bodies. They walked on clean land, drank clean water, breathed clean air, and ate clean food provided by Mother Earth. This is the Red Road. Most of these things we no longer have, but we still try to maintain what is left by building on the great spiritual foundation our ancestors and elders laid down. They prayed for our welfare, but their foresight could not cover such problems of today as drugs and alcohol. 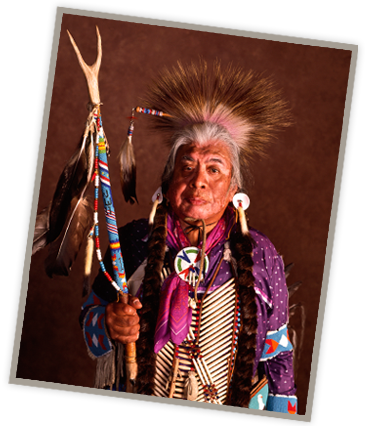 So, in order to keep the Red Road clean and good, as was intended by our ancestors, and also by elders we have known, we must be strong followers of our Indian ways. We must help all concerned people in the war against drug and alcohol problems, which threaten to destroy our young today. This is why all our powwows are kept free of drugs and alcohol. We can have good, clean fun and enjoy the Red Road with dignity as it was intended.